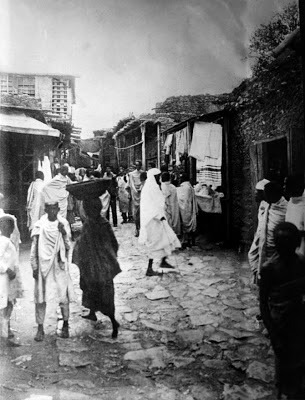 Decadent French poet Arthur Rimbaud came to Ethiopia (then Abyssinia) in 1880, settling in the eastern city of Harar. There, in the walled maze of crowded alleyways, he worked as a merchant, trading such fine exports as coffee, weapons, and infamously- slaves. He mysteriously gave up his bohemian french poetry scene and his tumultuous relationship with Verlaine, with the hopes of striking it rich in a city that was certainly even more chaotic then, than it is now. 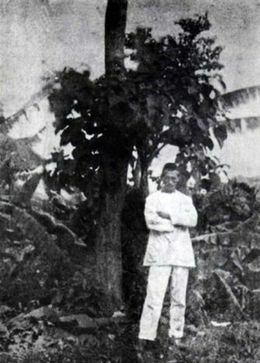 Rimbaud spent over 10 years in Abyssinia -having little contact with anyone back in France, until he developed a tumour in his leg, which he eventually died from after a failed amputation on Nov 10th 1891, at the ripe old age of 37. Now, I'm no Rimbaud, (despite my teenage obsession), but the similarities of my own current state to that of Rimbaud's in Ethiopia are somewhat distrurbing. One might say that I gave up on Calgary's poetry community ages ago, without even actually having been a part of it. I certainly have had my own share of screaming bohemian relationship dramas -as Bob Dylan would sing, "Oh, mine have been like Verlaine's and Rimbauuuud!". And, let's not forget the crucial similarity, that here I lie in my very own little worn and weathered hotel bed in Ethiopia, with a large lump on my ankle, bruised foot, alone and somewhat immobile, much like Rimbaud at the end of his days. 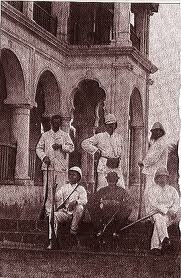 Though I'm certain Rimbaud (who due to his respect and influence within the Harari community at the time, was chummy with the Governor of Harar, Ras Makonnen, -father of future Ethiopian Emperor Haile Selassie, better known worldwide as the dude who Rastafarians worship and sing songs about while smokin' Ganja), had a bit more of a crazy decadent time here; housekeeper/concubines from the Somali coast, most probably a pet Hyena or two (perhaps that's an exaggeration), endless Qat plants to chew on and become psychotically intoxicated with -while I have spent most of my time simply drinking coffee and eating alot of sour Injera bread, alone. Still though, I like to keep the flame of inspiration alive, and pay homage when I can - even if its unintentional (the lame foot, and all). Tonight I think am going to drink some 80 cent beer and read Rimbaud, cursing the world for not appreciating my genius. Or something. Yes. Or, better yet, try and download a copy of "Rimbaud in Abyssinia" ( a biography of our decadent poets life at that time), onto my Kobo (which is certainly far more bourgoisie than anything Rimbaud would have done). Also, I'm fairly certain that I won't need any amputations for my sprained ankle, touch wood (or the services of any concubines) while I'm here, so maybe this whole comparision is downright absurd. Also, I am in the capital of Addis Ababa, not Harar. Also, I have no plan of making money here. Maybe I just really am getting bored of laying in bed, and am daydreaming myself into frenzy, because I have nothing else to do. And distances cataracting down into abysses!" 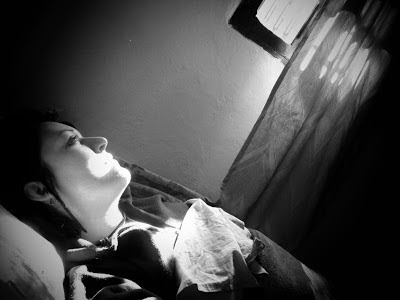 - Arthur Rimbaud, "The drunken boat"
Me... pretending to be Rimbaud.